A B-52 bomber has crashed shortly after take-off at a US base in Guam, the US Air Force says. It says all seven crew members safely left the aircraft after the incident at 08:30 local time (22:30 GMT Wednesday) at Andersen Air Force Base. 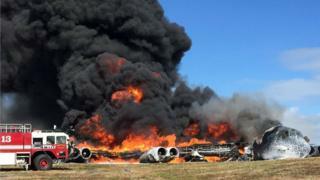 The US Air Force told the BBC it was treating the incident as a "mishap". The bomber was deployed to the US island territory from North Dakota as part of the military's continuous presence in the Pacific. Local news site Kuam quoted the Guam governor's office as saying: "We assure the public this does not appear to be an attack." The crew members from the 69th Expeditionary Bomb Squadron were on a routine training mission, the Air Force said in a statement. It said steps were being taken to minimise the environmental impact, without providing further details. Media caption"It's like a dump truck - nothing else has that type of range and capacity"
B-52s are still going strong after 60 years in service in the US military - from Vietnam to Afghanistan. Their main function is to provide the US with immediate conventional and nuclear global strike capability. Guam is a US territory in Micronesia in the western Pacific, about 6,000km (3,700 miles) west of Hawaii. The US Army's bases there are considered among the most strategically important in the region. In 2008, six crew members died when a B-52 crashed into the sea near Guam.